Chirasil-â-Dex containing an undecamethylene spacer (C11-Chirasil-Dex) was synthesized and used as a chiral stationary phase (CSP) in enantioselective GC. 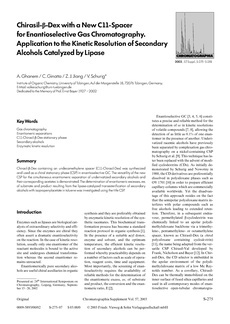 The versatility of the new CSP for the simultaneous enantiomeric separation of underivatized secondary alcohols and their corresponding acetates is demonstrated. The determination of enantiomeric excesses, ee, of substrate and product resulting from the lipase-catalyzed transesterification of secondary alcohols with isopropenylacetate in toluene was investigated using the title CSP.